Cells, whether prokaryotic (unicellular) or eukaryotic (multicellular), constantly interact with their environment. In the case of prokaryotic cells, environmental cues may initiate cellular functions such as cell division, sporulation or cell motility. These functions are generally for the survival and reproduction of each individual cell. In multicellular organisms however, cells work in harmony with each other, forming specialized tissues and organs that respond to environmental cues for the ultimate survival of the whole organism. For example, even during cold weather our bodies are able to maintain a core temperature of around 37°C. This is achieved by increasing the body’s basal metabolic rate through the secretion of hormones, in a mechanism mediated by the hypothalamus gland. These hormones act as signals to cells around the body, to initiate mechanisms that generate heat within the body. Similarly, signaling between cells is paramount in the immune system. As neutrophils encounter foreign entities such as bacterial cells, fungal cells or viruses, cytokines are secreted into the blood stream to attract other immune cells to the site of the infection and enable a proper immune response. Such ‘systems’ level biology is only possible because of cellular mechanisms that have evolved to enable communication between cells. These mechanisms may permit cells to influence the function of their neighboring cells, or modulate specific properties of their surroundings. Like many cellular processes, signaling must be tightly regulated, often by other signaling mechanisms. 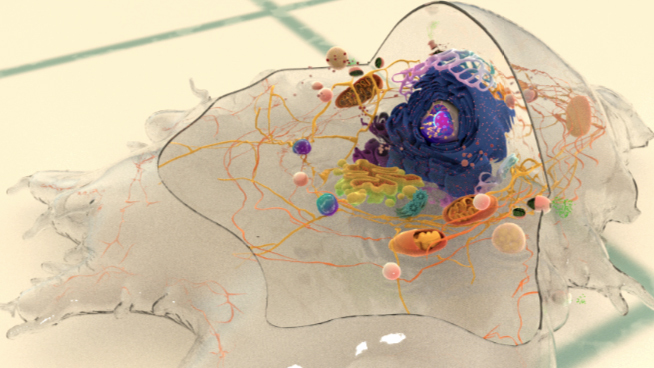 Cells not only interact with their immediate microenvironment, but may also detect and respond to signals originating much further away. Signaling pathways may be classified according to the source of a signaling molecule or ligand. 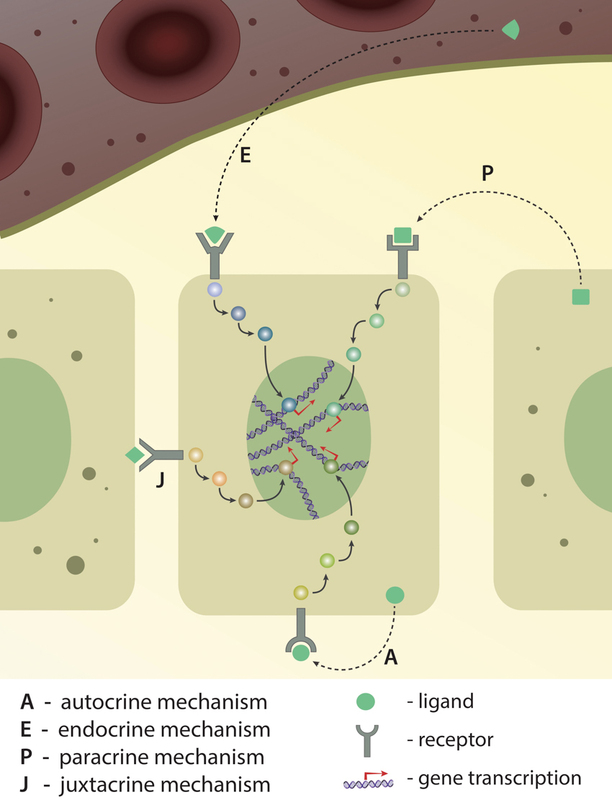 Depending on the ligand’s origin (from the same cell, from the neighbour cell or from far distance), recptor-ligand interaction and signaling pathway activation is classified into four different types: autocrine, endocrine, paracrine and juxtacrine. Activation of either of these pathways ultimately results in gene expression. Endocrine signaling is an example of long distance communication between hormone producing cells, tissues and glands and cells that express hormone receptor molecules. The hormones themselves are small molecules or glycoproteins that are usually secreted into the blood stream before being distributed throughout the body. Endocrine signals often originate from within the brain, however other glands and organs, including the thyroid gland, stomach, pancreas, liver, kidneys and reproductive organs, also produces hormones. One endocrine signal that must travel a great distance is that of follicle-stimulating hormone (FSH), which is sent from the anterior pituitary gland to the testes or ovaries where it stimulates the maturation of germ cells. 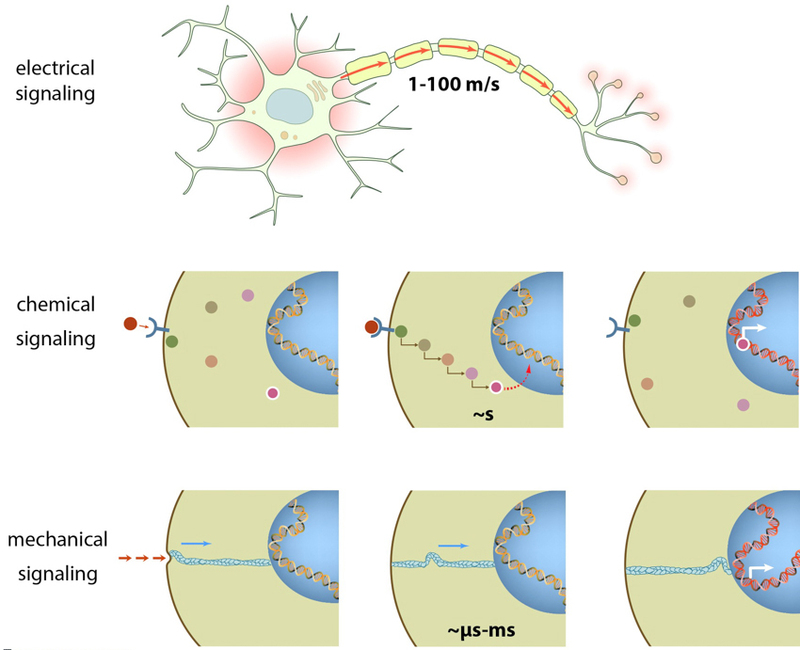 Paracrine signaling occurs between cells in close proximity to each other. Here, a soluble signaling molecule secreted by one cell diffuses to another cell in the local neighborhood. For instance, neurotransmitters secreted by neurons diffuse a few nanometers before binding to receptors on target neurons or muscle cells. Another example is the release of chemokines by neutrophils, which attract other cells through a process known as chemotaxis. Juxtacrine signaling occurs between neighboring cells that are in physical contact with each other. In this case, the signaling molecule is not free, but is instead bound to the membrane of the cell. It may then interact with a receptor on the membrane of an adjacent cell. An example of juxtacrine signaling is the interaction between the notch receptor, and its ligand, ‘delta’. Cell-cell junctions that contain cadherin complexes also work in a similar manner. In autocrine signaling, the signaling molecule originates from the target cell itself. This occurs when cells express receptors to a ligand they secrete. For example, blood platelets secrete eicosanoids, which influence their own activity. Autocrine signaling has also been observed during embryo development. Just as humans possess unique organs that allow us to interact with our environment via the five senses, cells also sense their environment through distinct mechanisms and subcellular structures. These allow cells to produce and detect a variety of signal types, from soluble molecules or chemicals, to electrical current and even mechanical cues that are transmitted via the push and pull of biomolecules. Cells sense their environment through distinct mechanisms and subcellular structures. These allow cells to produce and detect a variety of signal types, from soluble molecules or chemicals, to electrical current and even mechanical cues that are transmitted via the push and pull of biomolecules. Electrical signaling is limited to only a few cell types found in the nervous system, such as neurons and astrocytes. This high-speed method of communication involves the flow of charged ions, particularly Na+, K+, Ca2+ and Cl-, across a membrane, in a process known as action potential propagation. Cells that mediate electrical signaling are usually interwoven with low resistance pores such as gap junctions, which allow the passage of ions and other small sized solutes between cells. These cells often exist in networks and the electrical signal of one cell is quickly propagated to neighboring cells. This mechanism allows the transmission of electrical impulses along neuronal axons, and induces muscle contraction. Thus the continual beating of the heart is the direct result of electrical communication between one myocardiocyte and its neighbors. This is the most widely studied method of communication amongst cells and their environment. It usually involves the binding of a ligand or signaling molecule to a receptor located at or near the plasma membrane. In many cases this will induce signaling cascades where by one protein activates another protein, which subsequently activates another, and so on. This method of intracellular signal transduction involves many biomolecules from both lipids and proteins. Mechanical signaling refers to a process where a signal is triggered by a mechanical force such as shear stress or a pull/push applied to biomolecules. Usually, application of such force would induce a conformational change in the protein/receptor, thus exposing functional domains to the environment. Such a mechanism has been shown to facilitate vinculin binding to talin, which occurs only when the latter is stretched . Such stretching can trigger many other signaling mechanisms in the cell, leading to cytoskeletal re-organization and modulations in cellular and nuclear shape, as well as in gene expression. Mechanosignaling can often trigger cellular signaling processes much faster than a purely chemical means of activation. This is illustrated by the mechanical stimulation of focal adhesions in smooth muscle cells in which Src was activated in less than 0.3s. This rapid response was in contrast to the slow (12 second) response that followed chemical activation . There are many components that facilitate cell signaling. Although the full array of individual molecules cannot be discussed in detail here, the functions or roles that they play can be described. In some cases the protein components may serve as receptors, in other cases they may act as intracellular messengers, or, they may serve as sensors or effectors. Receptors can be broadly classified into three categories. As the name suggests, GPCRs are linked to a monomeric or trimeric G-protein via their cytosolic domain. Activation of GPCRs, which results from GDP to GTP exchange within this linked G-protein, subsequently activates a range of kinases which in turn facilitate phosphorylation events on target proteins. Similarly, activation of an ion channel also occurs through interactions with a ligand and also induces a conformational change within the protein. In this case however, the protein will acquire an open conformation that permits the ions to flow into the cell. Ion channels usually transport a specific type of ion, with Na+, K+, Ca2+ and Cl- being the most common that are associated with ‘information flow’ or signal transduction. Being associated with electrical signaling, ion channels are most commonly observed in muscle and brain cells. It should be noted that intracellular receptors, such as steroid receptors, are also relevant to signal transduction. These receptors are activated by hydrophobic ligands that can pass through the lipid membrane and therefore enter the cell passively. Nitric oxide gas and steroids like estrogen are examples of such ligands. Intracellular messengers, or secondary messengers, are the intermediate proteins or small molecules that carry a signal from the receptor to intracellular sensors and effectors. For every one receptor that is activated, multiple intracellular messenger molecules are activated and therefore it is at this stage that the signal is said to be amplified. Examples of intracellular messengers include calcium ions, enzymes such as adenylyl cyclase, or lipids such as inositol triphosphate, etc  . One key superfamily of intracellular messengers are the Small GTPases. It should be noted that it is rare for these molecules to function alone. Instead, each intracellular messenger will act within a larger signaling pathway. Considered the final stage in the signaling pathway or cascade, the sensor and effector proteins are responsible for the cell’s response to the signal. These may promote processes such as exocytosis, endocytosis, migration, actin remodeling, gene expression, etc. Examples include transcription factors which induce gene expression or actin binding proteins which induce actin remodeling, cell migration, etc. Cells do not respond to any one signal continuously. Instead many signal pathways are controlled by ‘molecular switches’ that can switch off a given response should they become detrimental to the required cell state or function. This may be achieved via a number of mechanisms. For example, receptors may be desensitized to the ligand, as is commonly seen for ion channels. The intracellular signaling molecules can also be degraded. This occurs, for example, with lipids such as IP3 which are metabolized by inositol phosphatases, and cyclic AMP / cyclic GMP which are degraded by phosphodiesterases. In another mechanism, Ca2+ ions are pumped back into calcium stores by pumps, thus restoring their normal concentrations in the cytosol. These mechanisms ensure that the cellular response is controlled by inhibiting the flow of information, and stalling the cellular response even after cellular detection of a given signal. Cell communication forms the very basis of cell survival and growth. Sometimes these pathways may be modified as an adaptation to certain physiological conditions. For example, during physical exertion, Ca2+ channels are modulated so as to allow heart cells to generate larger than usual Ca2+ signals. Similarly, during memory formation in the brain, some synapses are established with greater efficiency than others. Defective signal pathways may disrupt signal transduction which ultimately results in a form of cellular ‘miscommunication’. Cells may fail to respond to a ligand, or they may start responding to abnormally low ligand concentrations. They may fail to switch off the response in time, or may respond at the wrong time and wrong place in the body. There are several reasons why cell communication fails; defects in signaling pathways can be a result of genetic mutations in one or more proteins involved in the pathway or can be induced by external agents. Many bacteria, fungus and viruses exploit signaling pathways to their own advantage, such as the cholera toxin that induces cyclic AMP signaling in intestinal cells thus causing diarrhea. Most diseases are associated with a defect in at least one signaling pathway however in some cases multiple signaling pathways can be affected. This is the case in cancer where several levels of cell communication maybe affected. This ultimately allows the cell to grow and proliferate in extremely unfavorable conditions of low oxygen and nutrient supply. In recent years the relationship between cell mechanics, signal transduction and disease has become clearer, with the onset of many diseases attributed to a defective component of the cells mechanotransduction pathways. For instance, muscular dystrophies are diseases where the muscles become weak due to mutations in proteins that provide mechanical balance and signaling in muscle cells, such as dystrophin . Similarly, when the feedback mechanism provided by the renin-angiotensin system fails, the constriction or dilation of blood vessels, and hence blood pressure, may also become problematic, giving rise to diseases of the cardiovascular system . Finally, a functional polycystin 1 protein helps in calcium influx within the kidney ducts in response to shear stress. In the absence of polycystin 1, calcium influx is impaired and multiple calcium containing cysts may be formed in the ducts . What is the epidermal growth factor receptor signaling pathway?